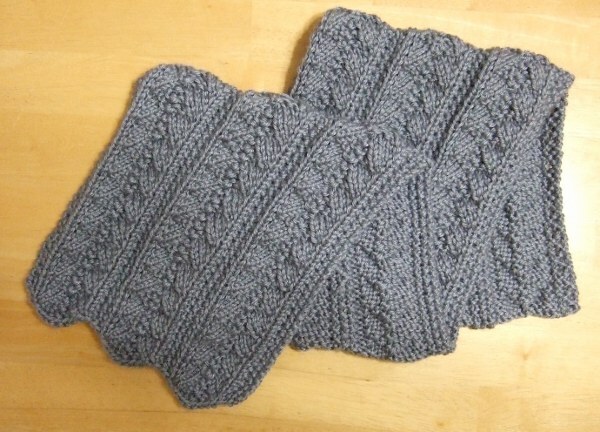 Repeat rows 1 – 6 until scarf is desired length. Cast off with a Row 1. Finish off and weave in ends. Another beautiful pattens. I can’t wait make this scarf. I hear you Debbie, i am making this scarf also. Thank you! I’m making this scarf, but i have problem with Row2 (p1,k2,m1,k1,p2,p3tog,p2,k1,m1,k2)three times is 48 i only have 45 if i don’t do k2 i’m fine.. please help!! The repeated portion is 14 stitches in both the number of stitches it uses and the number it results in. Three repeats of the 14 plus the three extra stitches makes the 45 of the row. Are you purling 3 stitches together? I could see having three extra at the end if you were purling 2 together. I agree with Mama’s count of 14 as the repeat. I am going to make the scraf as a Christmas gift. What is happening with it for you? I love the pattern for a scarf. Is there anyway a person could make this into an afghan? Absolutely! The original scarf is 8 inches wide. For every 8 inches of additional width you want, add 42 stitches to your cast on. Also, where the directions say to do something three times, repeat that across the row. I love this pattern and would like to make this for my grandaughter using naturally caron spa bamboo blend, #3 weight. Would that work? I am just getting back into knitting after many years away. That should work great and should be very soft. I have added a stitch when knitting, is m1 the same? I don’t ever recall seeing this stitch in a pattern before. Just reading it doesn’t seem to create a picture of how to do in my head. Does anyone know of a place you can go to see how this is done? Thanks. Answered my own question – just saw your tutorial how to on this site. Would have liked to be able to enlarge photos but will practice this stitch and see what happens. Here is a video I found on how to do an m1. Thanks ever so much for inspiration! This is a beautiful pattern. I am making it in a DK weight on #7 needles. It is a shorter scarf that fits nicely inside of a coat collar. I am making it 36″ long with 3 50 gram balls of yarn. I love this and making a scarf with Murano wool fromhttp://www.bendigowoollenmills.com.au/Product/tabid/55/2328/2328/211164/MURANO/Default.aspx So it will change colour up through the pattern. It is a beautiful pattern, thank you. The manufacturer recommends 4mm needles and you recommended size 5 mm and since I didn’t have those I decided to use size 5.5 and so far it is looking great. I used to knit a cardigan with beautiful collar by using the same colour, same pattern before following a famous brand pattern sheet. However, I have lost this pattern sheet already. Do you have one or have you knit a cardigan by using this pattern ? If yes, please kindly share with me so that I can pick up my memories. If you could remember what they called it I could search for it. I haven’t seen any. Do what is in the preceding parentheses three times. Sorry, I must have done something wrong. My math leaves something to be desired!! Think I got it now! I made this scarf. It turned out lovely. It is not hard, but has enough style in the stitches to keep it interesting. Thank you! I want to knit this scarf, however, row 3 is missing in your directions. Could you be so kind as to email me row 3. Thanks so much. So row 3, 5, 7, etc will all be the same as Row 1. Hello. I think I’m correct in noting that this was originally published in 2012? So as it is 2018 that I am GOING-TO-GET this (even if it kills me!) I was wondering has there been any corrections or additions to the original pattern? I have been having such a time getting this going, but the problem is not the pattern, it’s my brain, I keep finding steps that I left out and such… Anyway, I just wanted to make sure there’s nothing that I need to add or leave out before I once again, get going good and then need to tink back or restart. Thank you! I haven’t had to make any corrections to the pattern. I’m sorry you have to restart. Good luck. The cast off edge will have a slight ripple but may not be as large as the beginning edge.